Why do you have stuff? What does stuff to do for you? It’s useful to have an understanding of how you benefit from stuff because this will help you make good decisions about what belongings to have in your life. Today, I will identify a dozen ways that I believe capture all the different benefits we get from our belongings. There’s nothing special about these particular categories. You could always come up with different ones or ones that work better for you. And now, without further ado, here are 12 different ways we benefit from our possessions. 1. Survival. Some belongings provide sustenance, shelter or protection from the elements or anything that might harm us. Examples of this are food, a house or apartment, heaters, clothes, or umbrellas. 2. Utility. Some belongings make it easier, faster, or possible for us to do something. We have possessions that help us clean, travel, get information, open packages, write, cook, communicate, and accomplish many other activities. Examples include a computer, a car, tools, a stove, pens, scissors, or a cell phone. 3. Fun. Some belongings provide entertainment, recreation, or pleasure. They help you have fun and enjoy yourself. Examples include books, CDs, movies, television, games, sports equipment, or an iPod. 4. Self-care. Some belongings help you take care of yourself or improve yourself. Examples include exercise equipment, workout clothes, books, educational software, a computer, or vitamins. 5. Status. Some belongings give a certain impression to other people. This impression can be of power, wealth, or style, or it could also be an impression of rebelliousness or identification with a particular counterculture. A house, car, clothes, and jewelry, can all be instruments of status. 6. Supplement memory. Belongings are sometimes used to help remember past experiences or people. Examples include photos, keepsakes, letters and cards, and memorabilia. 7. Aesthetics. It can really improve quality of life to be surrounded by things that are pleasant to look at, that create an environment that is beautiful and aesthetically pleasing. Examples of this include wall hangings, paintings, curtains, jewelry, and decorations. I will give a personal example of this in my life. During the day, our bed has 14 pillows on top of it, even though we only use three of them while sleeping. Every night, we take 11 pillows off the bed, and every morning we put those 11 pillows back on the bed. Now if it were just me, I wouldn’t do this, but my sweetie really likes the way it looks. It’s important to her for the bed to have a certain aesthetic, and it’s important to me that she gets what she wants. I value her joyousness and radiance when things are the way she likes them. 8. Community. Some possessions help us to build closer ties with friends and family. Examples include gifts and anything used for entertaining. Also, some possessions allow us to fit in more comfortably with our community. For example, many communities have an understanding that people will wear clothes, so having clothes can help us meet those social expectations. 9. Preparedness. Stuff can help us be prepared for emergencies and other possibilities. This could include extra food, water, flashlights, radios, candles, and flares. This is also the “I might use it someday” category. When we get a new vacuum cleaner, we might keep the old vacuum cleaner to be prepared in case the new one breaks. 10. Comfort. Some belongings help us to be more comfortable, like shoes, a bed, carpet, and pillows. 11. Information. Some belongings contain information, like books, magazines, and newspapers, and other belongings allow us to obtain information, like a computer or a library card. 12. Identification. Sometimes we have stuff that we identify with, that helps define who we are, as part of the image we have of ourselves. You might say “I am a collector.” “I am a comic book aficionado.” But is that who you are? I’d like to continue by asking you another personal question. Who are you? Seriously. Who are you really? When I ask someone that question, they usually reply by giving me their name. Is that who you are? I know people who have changed their name. Who are they then? Have they become a different person? So who are you? Are you the person who lives at a specific address, in a particular town? So who would you be if you moved? Are you your job? Are you a software engineer, nurse, janitor, teacher, massage therapist, administrator, manager, CEO? Is that who you are? Well, if you got fired or left your job, who would you be then? Are you your belongings? If you let go of some of your stuff, would you feel like you’re letting go of a part of yourself? Does your stuff make you who you are? If your house caught fire and all your stuff got destroyed, who would you be then? Who are you when you’re on vacation? So who would you be without all your stuff? I believe that, at the root of it all, it’s our goal to determine who we are, to develop a deep understanding of ourselves and our own unique gifts, passions, and eccentricities, and then possess stuff that reflects who we are. Sometimes, however, the opposite happens. Sometimes our possessions create a box that we end up fitting into. Sometimes our possessions limit our conception of ourselves and who we are. Above, I listed ways our possessions serve us. I’d now like to point out a few things that possessions cannot provide for us. I invite you to take a minute and consider what brings meaning and happiness to your life. What makes your life worth living? I also invite you to remember that your most valuable possessions, and the possessions that can never be taken from you, are internal. Your resourcefulness, your creativity, and your own unique way of looking at the world — these are your most valuable possessions, and the qualities that make you unique and magnificent in your own way. I’d like to wrap up this post by acknowledging that this post and the last have been a bit “esoteric,” so now I’ll go the other direction and make the next post very practical. We’ll talk about how to put the theory into practice. We will go step-by-step through a sample organizing project from start to finish. Until then, may you be in touch with what brings meaning and happiness to your life. 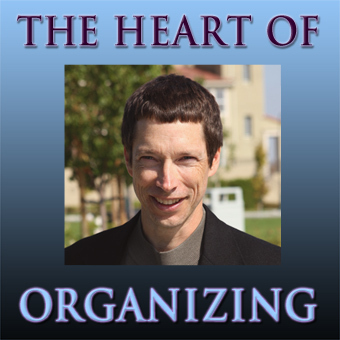 You are currently browsing the The Heart of Organizing: A Blog blog archives for August, 2010.